WildFly Elytron 1.8.0.Final has been released and is included with WildFly 16 Final, which is now available for download. In this blog post, we’ll take a look at what’s new in Elytron in WildFly 16. Setting a simple property for the HTTP Basic authentication mechanism in your application’s deployment descriptor enables silent mode. This is useful when paired with HTTP Form authentication, allowing human users to log in using the Form authentication mechanism and programmatic clients to log in using the Basic authentication mechanism. More details can be found in this blog post. When adding a file-based key-store in the Elytron subsystem, the type attribute no longer needs to be specified. Instead, the Elytron subsystem will now automatically detect the type. It is now easy to migrate legacy properties files to an Elytron filesystem-realm using the WildFly Elytron Tool. Take a look at this blog post for the migration steps. It is possible to make use of the new Security API in Java EE 8 defined under JSR-375 with Elytron. Details on how to get started with EE security can now be found here. Since WildFly 14, it is possible to obtain and manage certificates from Let’s Encrypt using the WildFly CLI. WildFly 16 now adds the ability to also make use of the web-based WildFly Management Console to do this. The details, including screenshots, can be found here. Elytron’s APIs allow identities to be modified, making it possible for users to update their credentials and/or other information about themselves. This two-part blog post shows how to create a web application for user self-service. Although there are a few different principal transformers that can be used out of the box with WildFly, it is also possible to implement custom principal transformers that can be registered using the Elytron subsystem. This blog post describes how to create and make use of a custom Elytron principal transformer. The full list of issues resolved is available here. As always, be sure to check out our blog posts page, where we collect references to all our blog posts on Elytron features. If there is an Elytron topic you’d like to see a blog post on, feel free to leave a comment on that page to ask for it. Questions on Elytron are also welcome on WildFly’s user forums. To learn more about the Elytron subsystem, take a look at the Elytron documentation. An Elytron principal transformer can be used to map a principal from one form to another. Although there are a few different principal transformers that can be used out of the box with WildFly, it is also possible to implement custom principal transformers that can be registered using the Elytron subsystem. In this blog post, we’ll see how to create a custom principal transformer that can be used to convert usernames to all upper case characters. This can be useful if your identity store contains upper case usernames but you want to ignore the case when a username is being specified during the authentication process. Notice that authentication fails since the username in our identity store is “BOBSMITH” not “BobSmith”. In the next few sections, we’ll see how to create and make use of a custom principal transformer that can be used to convert the given principal name to all upper case characters. To create a custom principal transformer, we need to create a class that implements the PrincipalTransformer interface. In particular, we need to provide an implementation for the apply method which will be used to map the given principal from one form to another. Our custom implementation, CasePrincipalTransformer, that converts the given principal name to all upper case characters can be found here. Next, reload the server using the :reload command. This time, authentication succeeds since our custom-principal-transformer gets used to convert the given username to all upper case characters, matching the username in our identity store. This blog post has shown how to create and make use of a custom Elytron principal transformer. Although Elytron was developed for the WildFly application server, it is possible to use Elytron outside of WildFly. This blog post is going to give an overview of how to secure an embedded Jetty server using Elytron. In particular, we’re going to take a look at an example embedded Jetty application that makes use of HTTP Basic authentication and we’re going to modify it so that it’s backed by Elytron for its security. The above example first creates a Jetty server instance. It then creates a constraint that specifies that accessing the /secured page requires authentication and that the authenticated user must have admin role. Next, it configures a Jetty security realm that’s backed by a properties file. It then specifies that Jetty’s BasicAuthenticator should be used to handle authentication. It also specifies the ServletHandler that’s being secured. This handler is configured with a simple servlet that just outputs the username of the authenticated user. Finally, the Jetty server instance is started. Let’s modify our simple Jetty application so that it’s backed by Elytron for its security. To do this, we're going to focus on the security related parts of the example, namely the security realm configuration, the Authenticator configuration, and the ServletHandler configuration. The code used in this example can be found here. org.wildfly.security:wildfly-elytron - This provides the WildFly Elytron security framework. org.wildfly.security.elytron-web:jetty-server - This provides classes for integrating Elytron based HTTP authentication with Jetty. Notice that our security domain has two users, alice and bob, with passwords alice123+ and bob123+, respectively. Note that alice has both employee and admin role and bob only has employee role. The next thing we’re going to do is create an ElytronAuthenticator instance. ElytronAuthenticator is a class from the elytron-web-jetty project that implements Jetty’s Authenticator interface. It is the class that will be used for validating a request. In particular, ElytronAuthenticator’s validateRequest method uses Elytron APIs to perform authentication for a request by making use of an Elytron SecurityDomain and an Elytron HttpAuthenticationFactory. Recall that the ServletHandler in the example was configured with a simple secured servlet that just outputs the username of the authenticated user. We’re now going to wrap that handler with an ElytronRunAsHandler, as shown below. This class is also from the elytron-web-jetty project and is used to associate the security identity that was produced after successfully validating a request with the current thread. These are all the changes that are needed to modify our example embedded Jetty application so that it’s backed by Elytron for its security. The complete code for this example can be found here. This will start the embedded Jetty server instance and it will be listening for requests on port 8080. Now try accessing the example application using http://localhost:8080/secured. First, try to log in as bob using password bob123+. Since accessing the /secured page requires admin role and since bob is not an admin, you'll see an HTTP 403 error. Hello alice! You've authenticated successfully using Elytron! This blog post has shown how to secure an embedded Jetty server using Elytron. The classes for integrating Elytron based HTTP authentication with Jetty can be found in the elytron-web-jetty project. Since WildFly 14, it is possible to obtain and manage certificates from the Let’s Encrypt certificate authority using the WildFly CLI. In particular, it is possible to get a certificate from Let’s Encrypt, revoke it if necessary, and check if it’s due for renewal. This blog post is going to give an overview of these new operations. First, configure a key-store in the Elytron subsystem that will be used to hold your server certificates. Note that the path to the keystore file doesn’t need to exist yet. Next, make sure your WildFly server instance is publicly accessible using the domain name(s) you will be obtaining a certificate for from Let’s Encrypt. For example, if you are requesting a certificate for the domain name “www.example.org”, then “www.example.org” needs to be publicly accessible. This is because Let’s Encrypt will attempt to access this URL when attempting to validate that you really do own this domain name. WildFly itself will handle proving that you really do own this domain name. Obtaining and managing certificates from Let’s Encrypt using the CLI requires a couple one-time configuration steps. After that, the new obtain-certificate, revoke-certificate, and should-renew-certificate commands can simply be used. These commands are shown below. We’re going to go through each of these commands in more detail in the rest of this post. Before obtaining your first certificate from Let’s Encrypt, a Let’s Encrypt account needs to be configured. First, configure a key-store in the Elytron subsystem that will be used to hold your Let’s Encrypt account key. The path to the keystore file doesn’t need to exist yet. name - The name of the certificate authority account. contact-urls - An optional list of contact URLs that Let’s Encrypt can use to notify you about any issues with your account. account-key - Information about the account key that will be used when communicating with Let’s Encrypt. key-store - A reference to the Elytron key-store that will hold your Let’s Encrypt account key. alias - The alias in the referenced key-store that will contain your Let’s Encrypt account key. alias - The alias in the key-store that will be used to store the certificate obtained from Let’s Encrypt. domain-names - The list of domain names to request a certificate for. certificate-authority-account - A reference to the certificate authority account information that should be used to obtain the certificate. agree-to-terms-of-service - Whether or not you agree to Let’s Encrypt’s terms of service (this only needs to be specified the first time you obtain a certificate from Let’s Encrypt with your certificate-authority-account). staging - Optional. Indicates whether or not Let’s Encrypt’s staging environment should be used to obtain the certificate. The default value is false. This should only be set to true for testing purposes. This should never be set to true in a production environment. algorithm - Optional. Indicates the key algorithm that should be used (RSA or EC). The default value is RSA. key-size - Optional. Indicates the key size that should be used. The default value is 2048.
credential-reference - Optional. The credential-reference that should be used to protect the generated private key. The default value is the key-store password. The obtain-certificate command will use the referenced certificate-authority-account to create an account with Let’s Encrypt if one does not already exist. It will then request a certificate from Let’s Encrypt for the specified domain-names. In particular, the obtain-certificate operation will prove ownership of the requested domain names, generate a key pair, generate a certificate signing request (CSR) using the generated key pair and the requested domain names, and submit this CSR to Let’s Encrypt. If successful, the obtain-certificate operation will retrieve the resulting certificate chain from Let’s Encrypt and store it along with the generated PrivateKey under the given alias in the key-store. These changes will also be persisted to the file that backs the key-store. For example, to request a certificate from Let’s Encrypt for the domain name “www.example.org” using the “myLetsEncryptAccount” certificate-authority-account, the following command could be used. The resulting certificate will be stored in the file that backs the "serverKS" key-store under the alias “server”. To make use of this server certificate that’s been issued by Let’s Encrypt for one-way or two-way SSL, this server key-store can be used to create a key-manager in the Elytron subsystem and an ssl-context that references this key-manager can then be created. More details about setting up one-way and two-way SSL can be found in the Elytron documentation. In the above example, alias identifies the certificate that should be revoked. The certificate-authority-account is a reference to the certificate authority account information that should be used to revoke the certificate. The reason is optional and indicates the reason for revocation. If provided, it must be a valid revocation string. Once the certificate has been successfully revoked, it will be deleted from the key-store. This change will also be persisted to the file that backs the key-store. The should-renew-certificate command can be used to check if a certificate is due for renewal. It returns true if the certificate expires in less than the given number of days and false otherwise. Its output also indicates the number of days to expiry. In the following example, should-renew-certificate checks if the certificate stored under the alias “server” expires in less than 15 days. If the expiration parameter is not provided, it will default to 30 days, i.e., should-renew-certificate will return true if the certificate expires in less than 30 days and false otherwise. Notice that in the above script, after renewing the certificate, we can simply execute the key-manager init command in order to ensure that the new certificate will be used by the key-manager from now on without needing to restart WildFly. This blog post has given an overview on how to obtain and manage certificates from the Let’s Encrypt certificate authority using the WildFly CLI. For more information on the Elytron subsystem, check out the Elytron documentation. With WildFly 13, there’s a new way to configure permissions in the Elytron subsystem. In particular, it is now possible to configure permissions using a new permission-set resource. After a permission-set has been created, it can be referenced when creating a permission mapper in order to assign permissions to an identity. This blog post has given an overview of Elytron permission sets. For more information about the Elytron subsystem, check out the Elytron documentation. With these new operations, it is now possible to set up one-way and two-way SSL for applications and management interfaces using only the CLI - going back and forth between the CLI and keytool is no longer necessary. This blog post is going to give an overview of these new operations. First, configure a key-store in the Elytron subsystem. Note that the path to the keystore file doesn’t actually have to exist yet. The generate-key-pair command generates a key pair and wraps the resulting public key in a self-signed X.509 certificate. The generated private key and self-signed certificate will be added to a new PrivateKeyEntry in the KeyStore. The generate-certificate-signing-request command generates a PKCS #10 CSR using a PrivateKeyEntry from the KeyStore. The generated CSR will be output to a file (in the example below, the CSR is output to server.csr). Notice that in the above command, alias=example refers to the PrivateKeyEntry that was created using the generate-key-pair command. The import-certificate command imports a certificate or certificate chain from a file into an entry in the KeyStore. This can be used to either import a trusted certificate or to import a certificate reply that’s received after submitting a CSR to a certificate authority. The export-certificate command exports a certificate from an entry in the KeyStore to a file (in the example below, the certificate is exported to serverCert.cer). The change-alias command moves an existing KeyStore entry to a new alias. The store command persists any changes that you have made using the above commands to the file that backs the KeyStore. This blog post has given an overview of the new KeyStore manipulation operations that are available via the CLI in WildFly 12. For information on how to set up one-way and two-way SSL for applications and management interfaces, check out the Elytron documentation. Some SASL mechanisms support channel binding to external secure channels like TLS. The name of a SASL mechanism tells us if channel binding is supported. In particular, SASL mechanisms that support the optional use of channel binding have two SASL mechanism names - one name that includes the “-PLUS” suffix, which implies that channel binding is supported, and one name without the “-PLUS” suffix, which implies that channel binding is not supported (e.g., GS2-KRB5 and GS2-KRB5-PLUS, SCRAM-SHA-256 and SCRAM-SHA-256-PLUS, etc.). Whether or not channel binding is used is determined during SASL mechanism negotiation. This blog post is going to show the server and client configuration needed to connect to the JBoss CLI using the SCRAM-SHA-256-PLUS mechanism, one of the SASL PLUS mechanisms provided by Elytron. Finally, generate a server keystore and a client truststore using the keytool command, as shown below. We’re going to use these to enable one-way SSL/TLS for the management interface. Now we’re ready to proceed with the server and client configuration needed to use the SCRAM-SHA-256-PLUS mechanism. Finally, reload the server using the :reload command. Notice that the wildfly-config.xml file specifies that the SCRAM-SHA-256-PLUS mechanism should be used and the username and password that should be used when attempting to connect to the CLI. It also configures an ssl-context using the client truststore that we created earlier. Now, we just need to specify this wildfly-config.xml file when connecting to the CLI. The following command connects to the CLI and executes the :whoami command. You should see the following output, which indicates that we’ve successfully connected to the CLI using the SCRAM-SHA-256-PLUS mechanism. This blog post has shown how to set up one-way SSL/TLS for the management interface and how to then use a SASL mechanism that supports channel binding to connect to the CLI. My previous blog post described how to secure EJBs deployed to WildFly 11 using Elytron and how to invoke them from a standalone remote client. This post describes how to invoke EJBs deployed on a WildFly server instance from another WildFly server instance using Elytron. We’ll refer to the server instance on which the EJBs are deployed as the destination server and we’ll refer to the server instance from which the EJB invocation takes place as the client server. As in previous WildFly releases, to be able to invoke EJBs deployed on the destination server, you can add configuration to the Remoting subsystem on the client server to specify the information needed for the outbound connection to the destination server. In WildFly 11, a remote outbound connection can now be specified by two things: an Elytron authentication context and an outbound socket binding. This blog post has shown how to invoke EJBs deployed on a WildFly server instance from another WildFly server instance using Elytron. If you’d like to see a more advanced example application that shows how to propagate the security identity of an EJB deployed on the client server to an EJB deployed on the destination server, take a look at the ejb-security-context-propagation quickstart. This blog post describes how to secure EJBs deployed to WildFly 11 using Elytron and how to invoke them from a standalone remote client. If you haven’t already, take a look at the Elytron documentation on how to create security realms, security domains, and authentication factories. In this post, we’ll make use of a security domain (“ApplicationDomain”) and a SASL authentication factory (“application-sasl-authentication”) that are already defined in the default WildFly configuration file in the Elytron subsystem configuration. The latter command above just clears the legacy security-realm attribute since it is no longer needed. Prior to WildFly 11, many WildFly client libraries used different configuration strategies. WildFly 11 introduces a new wildfly-config.xml file which unifies all client configuration in a single place. EJBs deployed to WildFly 11 can still be invoked using existing standalone remote clients that make use of the legacy naming and EJB client libraries from previous WildFly releases. This section walks through an example of how to migrate a remote client to make use of the new WildFly Naming Client and EJB Client libraries. To learn more about the contents of the above file, take a look at the Elytron Client documentation. Additional client migration examples can also be found here. This blog post has shown how to secure EJBs deployed to WildFly 11 with Elytron and how to invoke them from a standalone remote client using the new Naming Client and EJB Client libraries. If you’d like to see a complete example application that pulls everything described here together, take a look at the ejb-security quickstart. My next post will cover EJB invocations from a remote server using Elytron. Since WildFly 10 Final was just released, the OpenShift WildFly cartridge has been updated as well. This post will walk you through getting started on OpenShift and deploying a WildFly quickstart. If you already have an existing WildFly OpenShift app, you'll want to check out these tips for migrating your app to WildFly 10 Final. To use the OpenShift Web Console, just click here. To get started directly from Eclipse, you'll first need to install the OpenShift JBoss Tools package. Then, simply use the New OpenShift Application Wizard to create your app. With JBoss Developer Studio, the OpenShift JBoss Tools package is already installed so you can get started right away with the New OpenShift Application Wizard. Once you've created your app, it will be available at http://<WILDFLY_APP_NAME>-<NAMESPACE>-rhcloud.com. You can then use the WildFly CLI or Admin Console to manage your server. Getting started with a WildFly quickstart on OpenShift is simple. The following steps will demonstrate how to deploy the kitchensink quickstart, an application that demonstrates a few different Java EE 7 technologies, using the OpenShift Client Tools. git commit -m "Deploying the kitchensink quickstart on WildFly 10 on OpenShift!" That's it! The kitchensink quickstart will now be available at your application URL (i.e., http://<WILDFLY_APP_NAME>-<NAMESPACE>-rhcloud.com). This post provides some tips on how to migrate an existing OpenShift application to WildFly 10 Final. The result will be a new WildFly 10 Final application that's a clone of your existing one. This means that your new app will have the same git repository, gear size, scaling configuration, environment variables, deployments, etc. With both of these options, you should first replace the standalone.xml file from your git repo's .openshift/config directory with the WildFly 10 standalone.xml file. If your git repo contains any action hook scripts that end with "_jbossas", these scripts will need to be renamed to end with "_wildfly" instead. If your git repo contains any action hook scripts that reference OpenShift environment variables that start with "OPENSHIFT_JBOSSAS_", these scripts will need to be updated to reference "OPENSHIFT_WILDFLY_" instead. To see if you have any such scripts, have a look in the .openshift/action_hooks directory in your git repo. Follow the instructions here to install the RHC client tools. Follow the instructions here to install the OpenShift JBoss Tools package from the Eclipse marketplace. Similarly, you can also create your application using JBoss Developer Studio which comes with the OpenShift plugin installed. This results in a new WildFly 9 Final application that's a clone of your existing one - same gear size, scaling configuration, environment variables, git repository, deployments, etc. If you have an existing WildFly 8 or AS 7 OpenShift app, you can create a new WildFly 9 app using your existing app's git repo, as shown below. You'll want to first replace the standalone.xml file in your git repo's .openshift/config directory with the WildFly 9 standalone.xml file from here. Alternatively, you can leave off the --from-code option above and manually copy the contents of your old git repo to your new app's git repo once the new app has been created. Any action hook scripts in your app's git repo (i.e., in .openshift/action_hooks) that end with "_jbossas" will need to be renamed to end with "_wildfly". Any action hook scripts with references to OpenShift environment variables that start with "OPENSHIFT_JBOSSAS_" will need to be updated to reference "OPENSHIFT_WILDFLY_" instead. Fire up an OpenShift instance! Getting WildFly 9 running on OpenShift is easy, try it out now, it only takes a few minutes. For more information about the WildFly cartridge, check out the documentation. 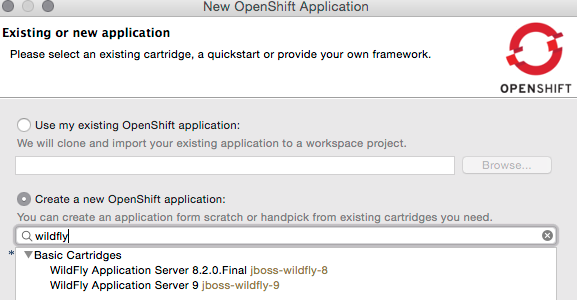 WildFly 8.2.0.Final on OpenShift - now easier than ever to create apps! That's it, no need to reference a long URL anymore in the creation command! For more information on how to access your application, take a look at the cartridge documentation. Enjoy! WildFly 8.1.0.Final on OpenShift - with JDK 8 support! git commit -a -m "Switching to Java 7"
git commit -a -m "Switching to Java 8"
For more information on how to get started with the WildFly cartridge, take a look at the cartridge documentation. As always, feedback is welcome on the WildFly community forums. Enjoy! Since WildFly 8.1.0.CR1 was released last week, the OpenShift WildFly cartridge has been updated as well. This creates an application that's a clone of your existing one (i.e., same gear size, scaling configuration, environment variables, git repository, etc.). This means that your new WildFly 8.1.0.CR1 application will have the same configuration and deployment(s) as your existing application. However, because the --from-app command relies on an application snapshot, it will take some time to complete (be patient!). This should improve going forward since snapshot exclusions have now been added to the WildFly cartridge to reduce its snapshot footprint. Be sure to check out the cartridge documentation for more information about the cartridge. Please try it out and provide feedback. Enjoy!